To make reservations, fill out our online field trip reservation form. 1. Submit online reservation request. 2. Receive verbal confirmation of field trip date and arrival time within 3 business days. 3. Receive an email within 10 business days with our Insider’s Guide including chaperone tickets, W-9, and more! 4. 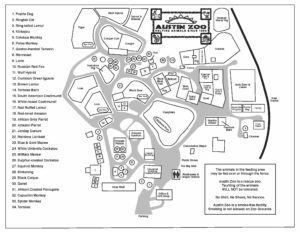 Prepare students to be quizzed about guidelines by an Austin Zoo staff member at check-in. 5. Collect monies from chaperones and others attending with special rates. 1. Gather headcounts of students, teachers and chaperones. 2. Park buses in our bus lot. Please do not block or unload in any fire lanes. 3. Walk students down the pathway parallel to our main parking to our group entry gate. 4. Lead teacher: check-in inside the Gift Shop, provide the headcounts collected and payment. 5. We will quiz your students about our guidelines and welcome you into the Zoo. NEW! New! Bus Drivers plus 1 teacher per 7 students will be admitted free of charge. We require a minimum of 15 people and one person must pay for the entire group. Additional chaperones, parents and siblings must prepay the lead teacher and enter with the group to receive this discount. Anyone checking in with us separately will be charged full admission rates. Not affiliated with a school? We offer a nonprofit or civic group rate for groups of 15 or more. Advanced reservations required. Click here to learn more. We accept MasterCard, Visa, Discover, cash, and school check. Payment is due in full at time of check-in. Our school programs are aligned with TEKS for pre-K through fifth grade. Programs are an additional $2 to $3 per student. The above brochure lists our traveling program options for pre-K through fifth grades. Call 512-288-1490 to schedule an offsite program. Chaperones are responsible for the behavior of their groups at ALL times and are required to accompany students for the duration of the visit. 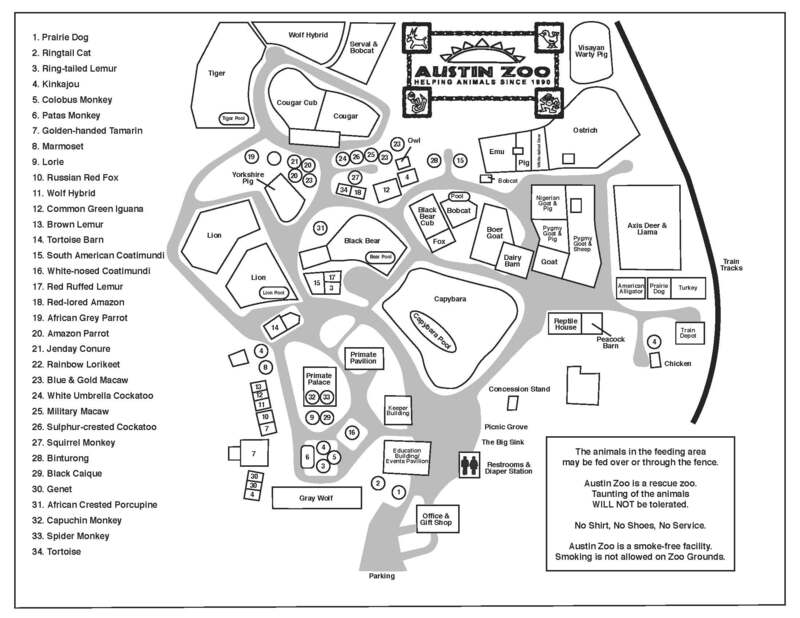 Austin Zoo has a zero tolerance policy. Treat the animals with respect. We have free roaming birds! Show your students what 5 feet looks like. We will ask them to show us when they arrive! Do not climb in the trees. Leave rocks, sticks, dirt, plants, flowers and animals on the ground. No smoking inside the zoo. If you must, please do so in the parking lot. Remember, the Zoo does not have water fountains. Please plan accordingly. By veterinarian advice, animal food is not available for school groups. 1 adult per 4 children to shop the Gift Shop please. Buses only unload and load in the BUS parking. Additional vehicles may park in our regular parking. Please do not block our fire lanes. Follow the safe pathway to our group entry gate. From June 1 through August 31, our concession trailer is open daily from 11:00am-3:00pm, and offers drinks, snacks, and shaved ice. From September 1 through February 28, the concession trailer is open Friday through Sunday from 11:00am-5:00pm. From March 1 – May 31 the concession trailer is open from 11:00am-3:00pm Monday-Friday and 11:00am-5:00pm Saturday-Sunday. The concession stand accepts cash only. Special arrangements may be made for your field trip! Please contact Jeanne Polk at (512) 970-2987 or by email at rawhiderocket@gmail.com. Questions? Call us at (512) 288-1490.